A place for everything and everything in its place. 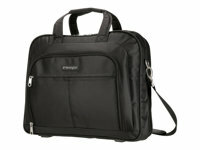 The Kensington SP80 Deluxe Case carries it all in comfort with padded handles and plenty of cushioning for your laptop computer and other essentials. There's even a built-in strap that attaches easily to your roller bag for easy airport travel.